The first phase of this Low Income Senior Housing project in SeaTac, WA, included 80 one- and two-bedroom units, two community rooms, a common kitchen, a library, and laundry facilities on three floors. Fazio Associates designed landscaped outdoor semi-private terraces for the ground floor units in the courtyard formed by the U-shaped building. Drought tolerant plantings were chosen to limit the amount of irrigation needed and to minimize the amount of long-term maintenance for all landscaped areas. Other landscaping elements designed by Fazio Associates include walks, trellis with climbing vines near entrances and focal points, and an open lawn area off of the courtyard to capture sited views towards Angle Lake and Mt. Rainier, putting the users in visual touch with a range of nature elements close to home and beyond. The second phase of the Angle Lake Court project is the new Community Services Building, which creates a multi-generational campus to complement the Angle Lake Court Senior Housing project completed in Phase 1. The Lutheran Community Services Building at Angle Lake provides 32,000 SF of space for childcare and social service programs, a health clinic and social service administration, as well as on-site parking for 92 cars and extensive site development. The extended-hours childcare and after school programs service 75 infants and children, while other social services support the immigrant and refugee population of South King County. 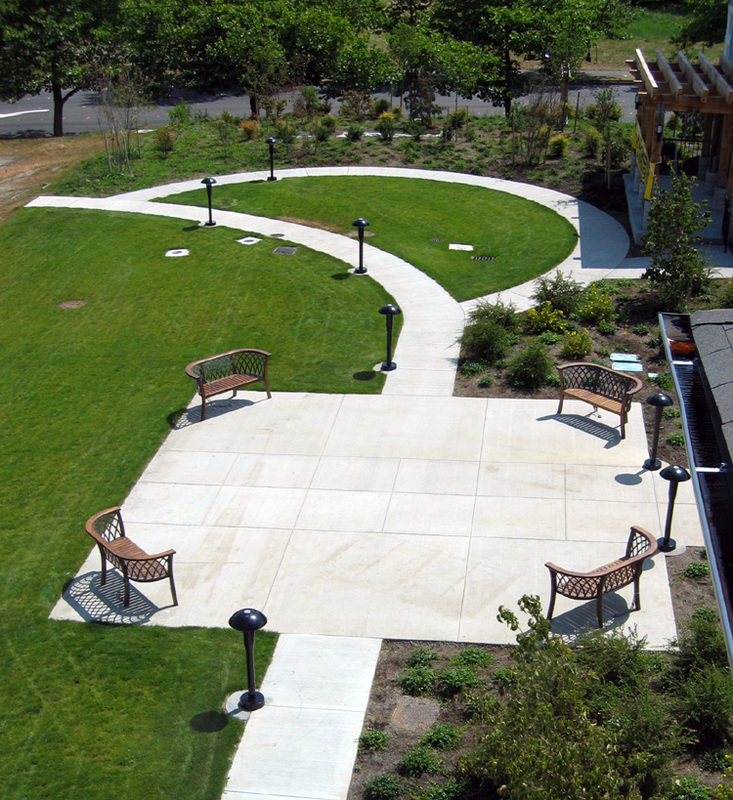 Fazio Associates was responsible for the overall site planning and landscape design for the project. The plan focused on maintaining existing trees for immediate scale, connecting the Services Building to the new Angle Lake Court, while being sensitive towards the various user groups and program elements. One of the central components to the site planning included a children’s play-area, which acted as an extension of the internal Childcare and Multi-Use room. Similar materials, colors and textures were used in some of the ground-plane elements in both to provide a seamless transition, and complement the use of the play area to accommodate various age groups and maximize the efficiency and safety for the children and their childcare staff. Since children are wired to receive and utilize sensory input from day one, it was also important to provide different types of sensory play elements into the design along with play equipment that would span a large age group. Also, an area for a P-patch was incorporated into the site to be shared by the senior housing occupants and the childcare after school programs.